If the HVAC system in your home does not seem to be working correctly, and yet its behavior does not lead itself to the conclusion that you have a mechanical problem with the machine, you might consider servicing air ducts, or even having a full-system air duct cleaning. The first culprit to check for, anytime your system does not live up to its potential, is the air filter. 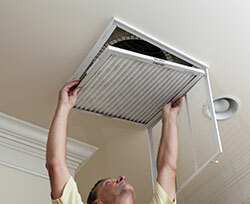 Air filter replacement is a quick, easy and relatively inexpensive way to improve the air flow throughout your duct system, which in turn improves the performance of your HVAC system. It also is very easy to tell whether the air filter is clogged. If the filter is covered with lint and dirt, then it needs to be replaced. If ever you look into one of your registers and see anything with two eyes blinking back at you, you might want to consider an emergency air duct cleaning to remove whatever critter, mammal or insect, has decided to dwell in your ducts. Also, if you have decided to have an HVAC unit cleaning done, and the initial inspector tells you that there are signs that little critters have been visiting the ducts, you need to be sure steps are taken to remove the infestation. Otherwise, your efforts to have your ducts cleaned are useless. If you have noticed at any time that some of your duct work is joined together with duct tape, you need to have those ducts repaired. As powerful as duct tape is, it can lose its stickiness after time, at which point you have excessive air leakage from that joint. Duct sealing should be done instead with either silicone caulking or specially manufactured cement with a cloth framework embedded into it. Don’t be afraid to consult Air Duct Cleaning Encino to get the answers to any questions you might have. Anytime holes are cut for pipes to travel between the attic and the basement, there is the potential for leakage. The slight pressure difference between the two spaces will be enough to draw the outside air into the house, making the HVAC unit work harder. Just remember the key to a happy duct system is air flow. The more controlled the air flow in the system is, the better your HVAC will run.